A rescued German Shepherd is now in the position to pay it forward, as he is now serving as a search-and-rescue canine in Missouri. If it weren’t for the faith that canine handlers Rich Enochs and Kate Sidun had in Diesel from the start, the once uncontrollable dog might not have gotten a second chance. In fact, due to his wild and sometimes aggressive behavior, young Diesel was only a week away from being euthanized for what was being interpreted as aggressive behavior. “It was horrible,” Sidun said of Diesel’s past conduct, which included intense outbursts and a temper that caused him to snap at passersby and almost rip his leash in two several times while on walks. It was clear to Sidun that Diesel needed intense socialization and training to give him the focus and drive he would need to be a great working dog. “We saw his potential, and we knew what his parents were,” Sidun explained, knowing that bravery runs in Diesel’s blood because of where he came from. You see, Diesel is no ordinary, run-of-the-mill German Shepherd — his parentage should have guaranteed him a distinguished role as a working dog from the start. His mother spent her days as a canine prison guard at a Czechoslovakian detention facility, while his father works with the Russian border patrol. While his first owner initially purchased Diesel from the breeder with intentions of training the pup for defense, Diesel ended up spending his early life with no job to do — torture for a dog bred to work, to think, and to challenge himself. Diesel’s first family did not exercise nor feed him properly, and finally the disgruntled dog had had enough. Fed up with his behavior, his owners gave him up, and Diesel ended up at a rescue in Shawnee, Kan. Bred for greatness, Diesel’s future now looked bleak. Even his adoption description was enough to scare most people away. “Rich looked at [Diesel’s] adoption page: no other dogs, no kids, not good with people, aggressive, on borrowed time,” Sidun told the St. Louis Post-Dispatch. But Sidun and Enochs decided to do what no one else had been willing to do for Diesel — give the dog a chance. The Monroe City Search and Rescue squad was in need of a canine for the Missouri State Fire Association’s Region B, and the experienced handlers had a hunch that Diesel would excel — and they were right. 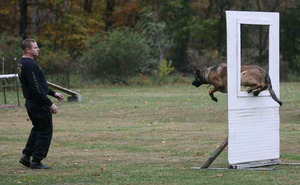 From the start of the training process, it was clear that Diesel was smart, determined, and excited about his work. “What he needed was leadership,” Sidun explained. After nine months of training, Diesel is now certified in wilderness and disaster rescue. He has also has made quite an impression in his community for being something of a sweetheart. Rich Enochs says that the future looks bright for Diesel. “I know he would put himself in harm’s way to help someone else,” Enochs told the Quincy Herald-Whig of 3-year-old Diesel, who has not yet made an official rescue but is ready to do so if needed. “Nothing’s going to stop him,” Enochs added. “He is one of the most amazing search and rescue dogs we have had yet,” Sidun proudly said of the dog that was once thought to be a lost cause.